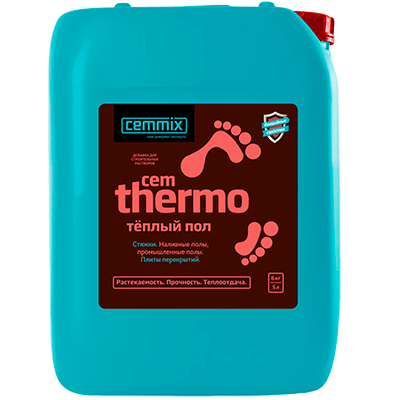 A special plasticizing and hardening admixture for filling heat-insulated floors. A high-performance plasticizing and hardening admixture for filling heat-insulated floors increases mobility and spreadability of the mixture. The main action: it increases the solubility of the cement clinker, interacts with the particles of cement – "pushes", and thus plasticizes the mixture, reduces the amount of water, reduces the amount of air pores, thus compacting the mixture, forms compounds with the cement minerals, whereby increases the strength and accelerates hardening, forms a waterproof layer on the particles, increasing their resistance to aggressive environments. Increases the water impermeability and improves protection from moisture penetration to the heating elements. The super-plasticizer allows obtaining highly-mobile concrete mixtures, reducing labor costs for concrete processing and laying, reducing the amount of water in the concrete mix; increases the degree of cement reaction, the strength, and durability of concrete products. Recommended for concreting foundations, walls, ceilings, floors, surface casts, manufacturing paving tiles, cinder blocks, euro-fencing, etc. 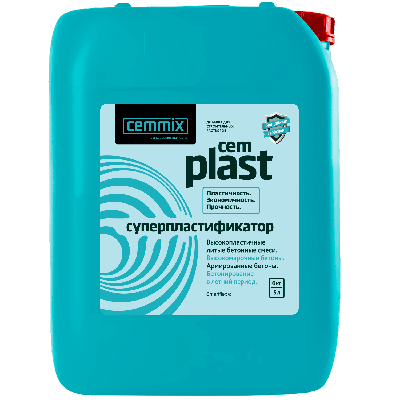 Allows obtaining cast concrete mixtures without delamination and water separation. The composition of the admixture adapted for local aggregates and types of cement, including slag-lime ones, with the slag content up to 80%. 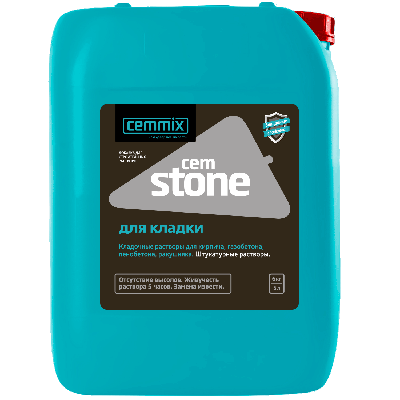 A highly efficient comprehensive admixture for masonry and other building mortars. Gives the mixture plasticity, and improves the ease of laying. Prevents delamination and water separation of the mortar mixture. Increases the mortar survivability up to 5 hours. Gives the mixture plasticity, improves workability, adjusts consistence, and prevents stratification and water separation of the mortar mixture. 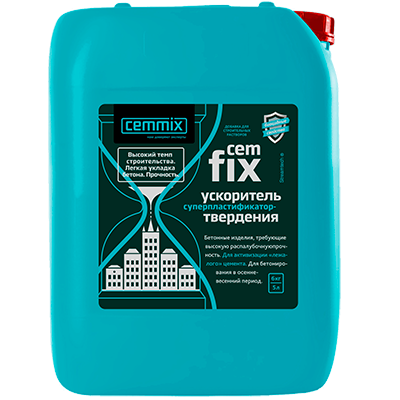 A multifunctional special admixture for foundation works. A super-plasticizing and super-water-reducing admixture for concretes. It is used to increase the strength, frost resistance, water impermeability and durability of concrete products that are in constant contact with the soil. The main effect of the admixture is increasing the strength. The admixture increases mobility and spreadability of concrete, reducing labor costs for processing, and allows laying without vibrating. It reduces the amount of water in the concrete mixture, activates additional components in the cement, providing higher density and, consequently, strength, durability, frost resistance and water resistance of the concrete products, and eliminates cracks appearance. The formulation of the admixture has been developed and adapted to local types of cement and aggregates, including slag-lime ones, with the slag content up to 80%. Perimeter pavement, preparation for ornamental elements of paving. It has a combined anti-frost, accelerating, and plasticizing effect. The admixture has been developed for concrete works at sub-zero temperatures of down to-20°C during construction of monolithic and precast-monolithic concrete and reinforced concrete structures, preventing possible destruction of the concrete structured due to subzero temperatures. The admixture also accelerates gaining strength, reduces the amount of chemically unbound water in the concrete, and the freezing point of the liquid phase. Obtain concretes with increased water impermeability, crack resistance, frost resistance, and durability. The hardening accelerator, has a combined accelerating and plasticizing effect. Recommended for concreting foundations, walls, ceilings, floors, surface casts, roads, manufacturing paving tiles, cinder blocks, euro-fencing, etc. The main effect of the accelerator is increasing the rate of gaining the stripping and grade hardness, increasing the mobility, the durability of the concrete structures and building mortars; increasing the solubility of the cement clinker, the degree of interaction with water. A waterproofing admixture for concrete. A hydrophobisating admixture for concrete. The hydrophobisator is designed to ensure water-repellent, frost-resistant properties, protection from moisture, dust, dirt to construction designs, buildings and structures made of concrete, aerated concrete, foam concrete, plastered surfaces by means of deep penetration throughout the entire volume after adding into the mortar. All types of concrete work. 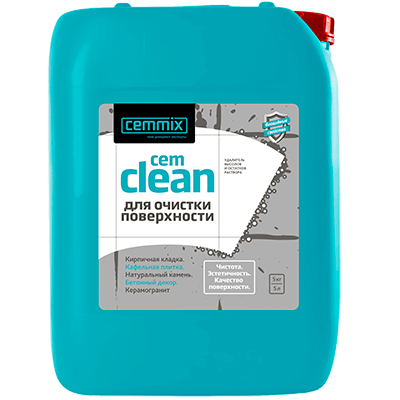 A multifunctional cleaning agent (concentrate) for removing efflorescence, remainders of the mortar and rust from the surfaces resistant to acid: brick, tiles, natural stone, ceramics, porcelain. The active acid components efficiently dissolve dirt and give an aesthetic look to the surface. Does not destroy the mortar, provided that the recommendations for use are observed. DANGER! Causes severe skin burns and eye damage. DPrecautions: In preparing a mortar and working with it, use personal protection equipment: goggles, gloves. In case of contact with skin or mucous membranes, rinse with plenty of water. If necessary, seek medical assistance. DEcology: Do not pour on soil, into water bodies or sewerage. Dispose of according to the local regulations. DTransportation: To be transported separately from food products. Fire- and explosion-proof. A comprehensive water-repellent for surfaces. A comprehensive water-repellent product for the surface of limestone, slate, limestone, brick, concrete, cement-and-sand plaster, sandstone, plaster, cinder blocks, CBPB, cement-and-sand and clay tiles, ceramic tiles, artificial and natural stone, marble, etc. 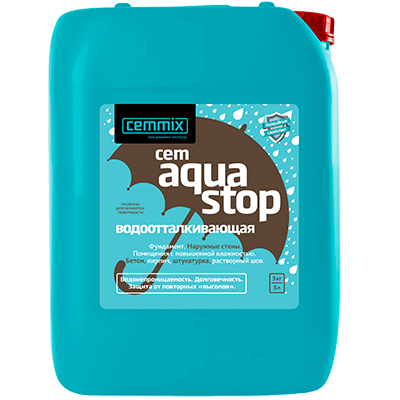 After applying CemAquaStop to the surface of the material, a very thin hydrophobic coating is formed, which is an invisible polymer coating, which, when exposed to moisture, closes the pores of the material, and does not allow water to penetrate inside. The hydrophobisator applied to the inner walls does not allow condensed moisture to penetrate deep into the structure of the walls and create on the surface a favorable medium for the development of harmful microorganisms. After treatment with the hydrophobisator, frost resistance and durability of the treated material increases several times. This is especially valuable for brick fences and pillars, plaster facades and basements of buildings that are most susceptible to damage from water and frost. Preserve the strength and insulating properties of the material. Storage: In original, unopened packaging, in a dry area, protected from direct sunlight and freezing, at +5°C to +35°C, not more than 36 months from the date of manufacture. 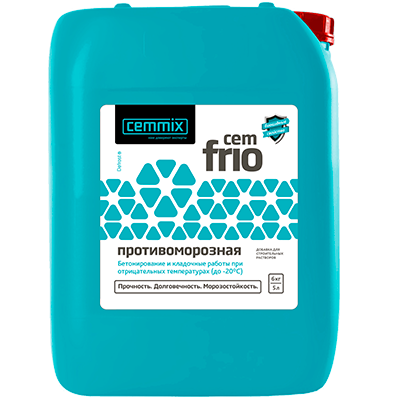 Freezing: Admixture CemAquaStop does not lose its properties after freezing and subsequent slow defrosting at room temperature and careful stirring. Dosage: Consumption depends on the porosity and water absorption of the treated surface and the application method. •	cinder blocks, decorative plaster, etc. : brush – 200 – 350 ml/m2, roller – 150 – 170 ml/m2. The substrate should be completely impregnated with the hydrophobisator; therefore, the required amount of the solution is calculated based on the porosity of the wall material. 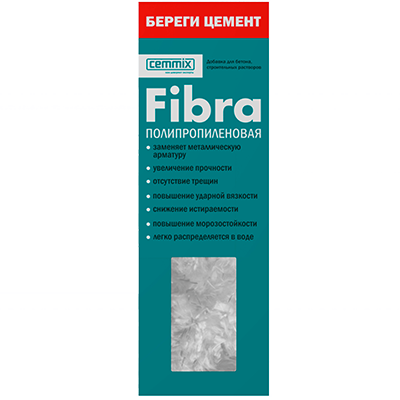 A universal polypropylene reinforcing fiber for adding into the mortar. A polypropylene reinforcing fiber, an admixture for concretes. A polypropylene reinforcing fiber, an admixture for concretes. A substitute for iron rebars. Significantly cheapens, simplifies and speeds up concreting with inserts. It increases impact ductility of concrete and pour-in-place floors (when heavy and hard objects fall on the floor, an insignificant dent appears on the concrete without cracking). The use of fibers for plastering and masonry work prevents cracks caused by shrinkage deformations of the mortar. It is easily soluble in water. Reinforcement for plastering and masonry mortars. Precautions: Do not inhale. In case of contact with the eyes, wash with water. Ecology: Do not pour on soil, into water bodies or sewerage. Dispose of according to the local regulations. In preparing the mortar individually, admixtures for concrete are not only useful but sometimes necessary. Judge for yourself: it is not for nothing that engineers at factories have long ago considered all advantages of using the admixtures and have been actively using them. Significantly save on construction – on vibration prevention (not needed with proper selection and use of plasticizers), and on cement (admixtures increases the strength up to 20% so that you can reduce the amount of cement used in the mortar without sacrificing its strength). Improve durability of concrete structures - with admixtures, concrete gains strength evenly, without segregation. Adhesion to the reinforcement bars and surfaces significantly increases. 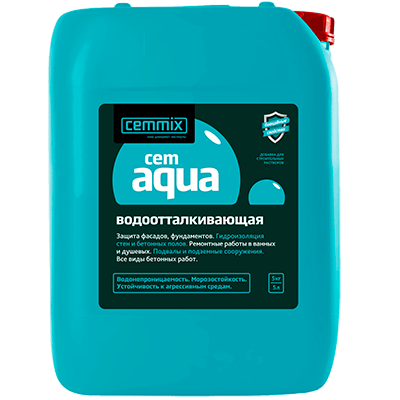 Improve the waterproof quality of concrete - with the use of appropriate admixtures, concrete gets good protection from soaking, its frost resistance and gas permeability also improve. Concrete retains its ability to "breathe", which prevent development of mold and fungi. Moreover, adding waterproofing admixtures at the stage of mortar batching will save you the time-consuming and dirty work of applying "classic" membrane waterproofing with bitumen and similar materials. Through the use of an admixture, common cement mortar may be turned into a mortar for pour-in-place heat-insulated floor, significantly saving on expensive ready-made mixtures. With the use of appropriate admixture, you will get a durable surface cast resistant to impact loads with high resistance to abrasion and excellent thermal conductivity. Anti-frost admixtures allow planned works even at subzero temperatures without loss of final strength of the structure. You don't have to interrupt construction in the winter and waste money on storing and protecting prepared materials from snow and cold. Save on expensive gypsum plaster. With concrete admixtures, you will get a great plastering mortar with long lifetime (up to 5 hours), durable, with excellent adhesion to the surface, giving no shrinkage cracks, and resistant to dripping from the walls during hardening. To summarize: using concrete admixtures ensured significant savings of time and money in all concrete works! You will not have to buy a wide variety of expensive ready-made mixes for different jobs – it is sufficient to use admixtures and standard components of the cement mortar. We want every building to remain reliable, safe and durable. That is why we produce Cemmix admixtures. We strive to make available to the average consumer the quality of construction which until recently has only been available to professional builders, with the use of expensive concrete ready-mixes produced by major concrete plants. Thanks to our extensive experience, we understand the peculiarities of concrete works in local conditions. So, we tried to make our products as simple-to-use and efficient as possible. 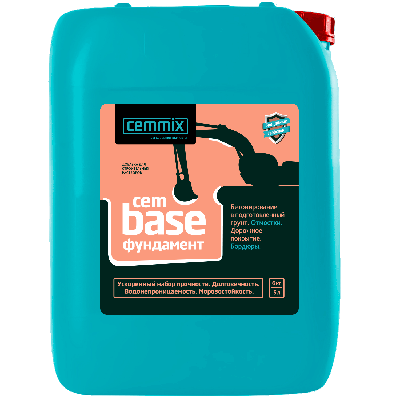 Using Cemmix, you will get the highest quality concrete with the strength and durability consistently high, even despite the quality of cement, sand, and fillers available at your location, which is not always the best. Our prices are our pride. Thanks to completely domestic production and raw materials we have made our materials as accessible as possible to developers of various scales: from individual builders to large developers.